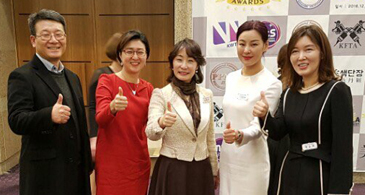 Soo & Jin Co. CEO Park Soo-Jin (second from left) poses with Between Co. Director General Lee Ju-Woon (left), Ellin Beauty Academy CEO Seo Young-Shin (center), Ellin Skin Educational Center CEO Tae Soon-Hi (right), and with an unidentified Chinese buyer at the launching show in Beijing, China. 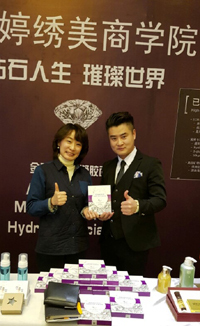 “Between Co.,” the just one-year-old bio material development venture firm (CEO Kwon Joong-Ki), has gained good responses at the launching show in Beijing to recruit its agencies in China with its new product, JIE Diamond Baby Face Mask. "Soo & Jin Co.," a professional design company led by CEO Park Soo-Jin, participated in the new product's development planning. Ellin Beauty Academy of Korea (CEO Seo Young-Shin) and Xian Ting Xiu Mei Co. of China (CEO Celine) jointly organized the event held at the Beijing Joyful Rose International Hotel Convention Hall in China on Dec. 18, 2016. About 300 CEOs, executives, and other guests from the local beauty and cosmetics companies in China attended the launching show. To introduce natural materials for healing damaged skin such as burn and wound now in study to skin care solution, Between Co. developed Extra-cellular Matrix (ECM) processing technology. The company also grafted it on the already possessed and patented material processing technology to complete the ECM complex. Through its collaboration with CoSeed BioPharm (CEO Park Seong-Min), it developed a new dosage form to apply fundamental cosmetics by appraising cosmetics synthesis and efficiency with the ECM complex. It has a merit of supplying high moisturizing effect and enriched protein to skin. Meanwhile, the research team developed the bio hydrogel by applying the ECM complex to hydrogel, not general sheet pack, in cooperation with its counterpart of Beauty Cosmetic Co. (CEO Oh Han-Seon). Bio hydrogel has a special merit of wearing it for a long time so that people can engage in housework or business activities and sleep after wearing the pack. Accordingly, it is possible to do regular activities after wearing it at such dry places as plane, library and office. CEO Seo Young-Shin of Ellin Beauty Academy made various efforts to remove many bottlenecks in the course of skin management. At that time, CEO Seo came across the initial ECM mask pack Between had developed as a solution exclusively for skin management and tried to develop bio hydrogel containing the ECM complex. It was the moment of meeting a beauty expert and a material expert. Soo & Jin Co., a professional design company led by CEO Park Soo-jin, participated in the new product's development planning. For development of products aimed at China, the Asia's biggest beauty market, not to mention Korea, CEO Park exchanged views on the product name and design with CEO Celine of Xian Ting Xiu Mei Co.
Soo & Jin Co. developed an independent brand, named JIE, by differentiating it from the Between's original brand, REJIE, and named the Diamond Baby Face Mask by reflecting the Chinese opinion. After about six-month process of product, it started to churn out the products in October. The products were manufactured by Beauty Cosmetics through the OEM method. Right after the production, it displayed the goods at the Beauty Fair (Oct. 16~18, 2016) held in Beijing and appraised Chinese consumers' responses to find and improve little problems in package. In October in 2016 after the Beijing Beauty Fair, CEO Seo and CEO Celine jointly planned a product explanatory meeting and an agent-recruiting launching show for brisk marketing in Beijing in earnest. They decided to host the launching show on Dec. 18, 2016. Domestic beauty experts, including CEO Seo and Dr. Lee Joo-woon, the director-general of Between Co., attended the launching show. Delivering a speech at the technology explanatory meeting, Dr. Lee said, "Bio hydrogel means the beginning of pack evolution toward the fourth generation." An event was also arranged to help participants wear the new mask pack directly and appraise its quality and efficiency. Meanwhile, CEO Celine who came to Korea on Dec. 5 for the launching show, directly visited the Beauty Cosmetics production facility in Eumseong, North Chungcheong Province. He also visited the Between Research Center to demonstrate the product development process and efficiency appraisal. For exports to China in earnest, a sanitary license approved by the Chinese government is a must. "Between Co." is in the process of getting the sanitary license, which requires some six months in general. CEO Seo armed with the insight as a skin beauty expert is planning a variety of fundamental lines. To this end, Between, Ellin and Soo & Jin Co. developed the new brand, Jiellin, and filed a trademark application in Korea and China in November. The collaboration among the Between's technology development ability, Soo & Jin Co.'s design sense and the Ellin's beauty expertise is expected to spread further in the global market in the future. - Characteristics: In-depth education by the Chinese Academy CEO is possible.